I’m not on the register, what can I do? 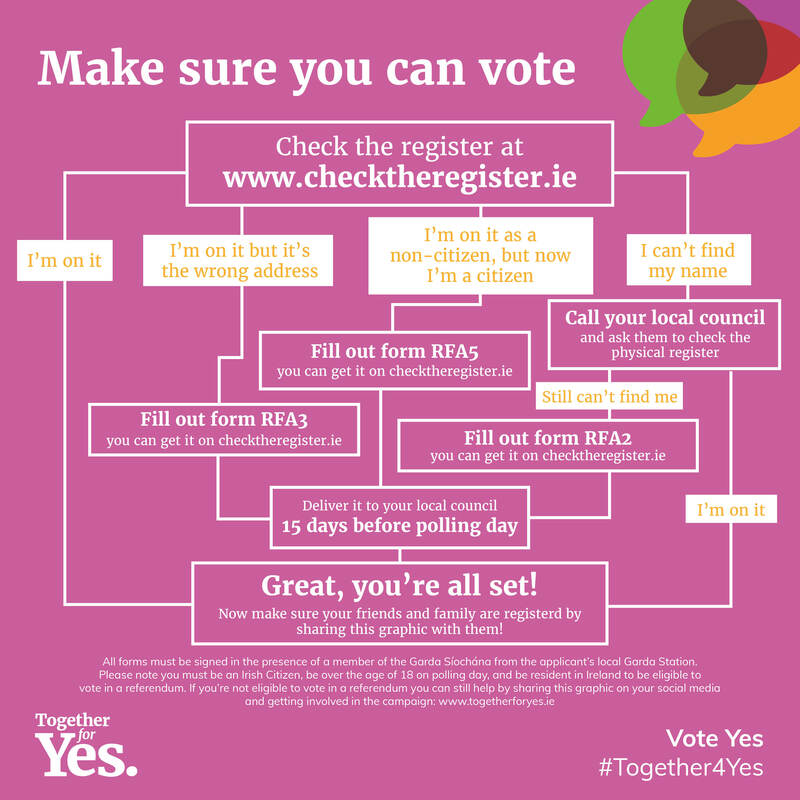 Eligible voters who are not on the register can apply for inclusion on the supplementary using application form RFA2 which is available from City and County Councils or can be downloaded from www.checktheregister.ie. Your application must be received by your local authority at least 14 days before polling day (Sundays, public holidays and Good Friday are not counted as days for this purpose). This form must be completed in the presence of a member of An Garda Síochána. You must bring photo identification with you. Polling Cards: These will be issued to every person registered to vote. The card will provide details of where to vote. Ideally polling cards, along with photo ID, should be taken to the polling station. Polling Date: The Referendum will take place in 25th May 2018. Polling Station times: Polling will take place between 7am and 10pm. Can I apply for a postal vote? Postal Voting applications ends 22 days (excluding Sunday and Bank Holiday) before polling day. What is the wording of the proposed amendment? The Government has proposed to remove article 40.3.3, and insert a new clause stating “Provision may be made by law for the regulation of termination of pregnancies”. This would be known as the 36th Amendment.